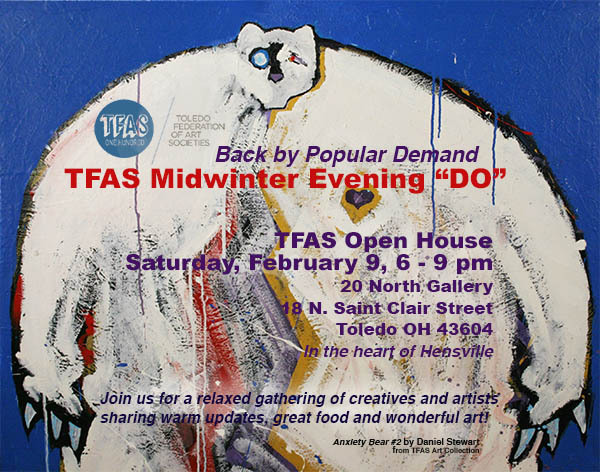 As a member group of the Toledo Federation of Art Societies (TFAS), 20 North Gallery will proudly host the TFAS Midwinter Evening “DO,” member meeting and free public open house on February 9, from 6 – 9 p.m.
Now celebrating its 102nd year, TFAS is a non-profit community arts service organization comprised of over 20 local and regional independent artists and 22 Toledo-area arts organizations, including The Arts Commission; Toledo School for the Arts; the art departments of The University of Toledo, Bowling Green State University; Lourdes University and Owens Community College; local independent galleries and studios; as well as its original founding groups: Toledo Museum of Art, Athena Art Society and the Tile Club of Toledo. Semi-annual social meetings are part of the networking service that TFAS provides its members and the public. 20 North Gallery and the other members of TFAS will be welcoming friends and fellow creatives at the free Public Meet & Greet on Saturday, February 9, from 6 – 9 p.m. The open house reception will offer a free light appetizer buffet and cash bar by Venue. Attendees will enjoy conversation with fellow creatives, hear updates and provide feedback on TFAS’ new community project and initiatives, while interacting with 20 North Gallery’s current exhibit, Toy Stories: Paintings by Aaron Pickens. Pickens is one of the independent artist members of TFAS, as a result of his winning Best of Show at the NowOH 11 (The Annual Northwest Ohio Community Art Exhibition) at Bowling Green State University in 2018. In addition, open house guests have the opportunity to win exquisite, art-centric door prizes provided by TFAS-member organization, the Toledo Museum of Art. Reservations for the event are not required, but appreciated (419-241-2400 or info@20northgallery.com).